Have you ever avoided reading a book because of its fans? Warren Ellis’ Nextwave: Agents of H.A.T.E. was one of the first comics to really understand and manipulate social media. The publication of every issue was met with the creation of GIFs, memes and a rabid need to "spread the word." There was even a theme song written for the book. Back then, I thought it just seemed stupid and pointless, and the overselling of the book kept me away. As it turns out ... they were right. Nextwave is pretty amazing, although a lot of what makes it work depends on context. The key to Nextwave’s success is that over anything else, Ellis is parodying himself. Like Stormwatch, Planetary, The Authority, and Global Frequency, it’s about a team of unusual individuals fighting bizarre threats, but all subtlety is thrown out the window. Ellis isn’t shy about this lack of subtlety, either -- the book frequently makes asides celebrating the explosions and violence on the page. Important pieces of backstory are done as one-panel gags, text boxes, or are just simply ignored. When we first encounter the main characters, they’ve been working as a team for quite some time, but how they met is never properly explained. The main characters are parodies of themselves to a degree. One of them, the Captain, is Ellis’ own creation, although supposedly he’s a stand-in for various minor “Captain” characters throughout comics. Monica Rambeau (formerly Captain Marvel), despite being the team’s most powerful member, ends up having her career turned against her in some of the book’s sillier moments. Tabitha Smith, a.k.a. Boom-Boom of X-Force, is now brain-dead trailer-trash -- the comics’ words, not mine. Not all of the changes are bad, though. Aaron Stack, a.k.a. Machine Man, has gone completely over the deep end, turning into Marvel’s version of Futurama’s Bender. Elsa Bloodstone is less of a parody and more of a simplification, turning her into a single-minded badass. Over a series of two-issue arcs, the Nextwave team fights a variety of threats, many of which are based on classic Marvel characters. One of Ellis’ strengths is that, no matter how much he mocks the characters, he’s a Marvel fan at heart. The infamous and instantly memetic Fin Fang Foom fight is just the appetizer. In issues #7 and #8, for instance, they fight the Mindless Ones: rocky, visor-eyed creatures from another dimension. The Mindless Ones have posed a serious threat to the Fantastic Four and Avengers (and they served a key role in Marvel Boy). Here ... they’re seen indulging in teenage pranks, beginning in issue #8 with an homage to West Side Story. Ellis goes the other way, ramping up the threat when the team encounters more serious versions of the parody superheroes from Marvel’s Not Brand Ecch. One highlight in this final arc comes when most of the team is sent into their greatest fears. Stuart Immonen gets to vary his art styles, such as when he turns Monica Rambeau into a pastiche of Marvel Boy, or when he draws Elsa Bloodstone in the style of Mike Mignola’s Hellboy. The final villain is another old Marvel character, and the circumstances of who he is and how he is revealed will remain unspoiled here, mostly because you’ll think I’m insane if I try to type it out. Along with his ability to change his style, Immonen brings a cartoony yet detailed aesthetic to Nextwave. Ellis specifically gave him a sequence of double-page spreads in the final issue so that he could let loose, and Immonen pays back the favor by filling all of those pages with expressive detail. It’s tricky to do a collaborative funny comic, since all parties involved have to synch up their senses of humor. But Ellis, Immonen, inker Wade Von Grawbadger, colorists Dave McCaig and Paul Mounts, and letterers Chris Eliopoulos and Joe Caramagna were able to come together to pull it off. This is the third time I’ve mentioned Eliopoulos specifically, and he keeps popping up as the letterer of some of my favorite comics. He’s perhaps the most inventive letterer in the business right now. Besides using the internet, Nextwave reaches past its own story pages for humor. The “primer” recap for each comic is reprinted; these take the form of question and answer sessions that get more and more melodramatic as the series goes on. This style has been replicated with the current A+X series with some success. The letter pages tell the story of the Lettermatic 7053, who goes from answering fan letters from Julius Caesar and readers from the 23rd century to breaking down from an existential crisis. There’s even a black and white “Crayon Butchery” version of issue #5’s cover; you could color this yourself back when it was initially printed, although the trade’s glossy print doesn’t allow for this. These little extras add a lot of value, especially when trade paperbacks like Nextwave: Agents of H.A.T.E. Ultimate Collection costs thirty-five dollars. 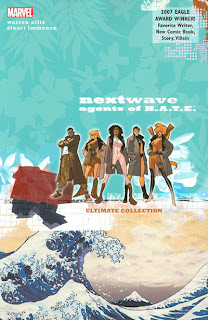 In a way, Nextwave: Agents of H.A.T.E. is the antithesis of Thor and the Warriors Four. Both use knowledge of the Marvel canon to add weight to a story that, at the end of the day, is pretty silly. Of course, the big difference is that Nextwave is far more violent, but I won’t hold that against it. Learning that Nextwave actually is as good as its promoters claim was a pleasant surprise. Note: while the entire series is collected in two volumes, I’m not sure if the split version has all of the extras as the Ultimate Collection. In any case, the series only gets better as it goes along, so I recommend the full version. I understand how overhyping can put you off from reading a book before you even try it. For instance, I'm a fan of Kieron Gillen's Journey into Mystery run, but if my first contact with it had been through rabid fans on Tumblr raving about how the latest issue made them "squee" or gave them "the feels", I would stay away from it like the plague. In Nextwave's case, I liked the book from the beginning, but I grew to love it when the Mindless Ones started dancing down the street. A second year would have been great, but I'm happy with what we got. I'm with you on "Journey Into Mystery"; what made me get past the crazy fans was the desire to see if it answered any questions about "Fear Itself". (It doesn't.) Kieron Gillen really gets into the fan interaction; each issue of "Young Avengers" starts with a "Yamblr" recap page, and they're hysterical. The Mindless Ones dancing is one of the greatest moments in comic book comedic timing, rivaled only by Lady Blackhawk figuring out that "that boy is fancy?!" in "Birds of Prey".